This report was prepared under contract #HHSP23337003T between the U.S. Department of Health and Human Services (HHS), Office of Disability, Aging and Long-Term Care Policy (DALTCP) and Truven Health Analytics, Inc. For additional information about this subject, you can visit the DALTCP home page at http://aspe.hhs.gov/office_specific/daltcp.cfm or contact the ASPE Project Officer, Pamela Doty, at HHS/ASPE/DALTCP, Room 424E, H.H. Humphrey Building, 200 Independence Avenue, S.W., Washington, D.C. 20201. Her e-mail address is: Pamela.Doty@hhs.gov. The shift to managed care models for LTSS services has significant implications for organizations which provide LTSS services to Medicaid enrollees, from nursing home providers to small providers of home and community-based services (HCBS). Traditionally, LTSS providers have operated under contract directly with state or local governments, received referrals for new clients from these governmental agencies, and been paid for services through state Medicaid claims processing systems. Under MLTSS program models, these LTSS providers are now required to negotiate contracts with the managed care entities selected by the state to operate their MLTSS programs, to provide LTSS services to the members of each managed care plan in accordance with the terms of those contracts and to submit claims separately to each managed care entity with which they contract. This shift to MLTSS models has raised questions about managed care's impact on traditional Medicaid LTSS providers, including case management agencies, HCBS providers, nursing homes, and other LTSS providers. By "traditional" providers, we mean any LTSS providers who were participating in the Medicaid program prior to implementation of the MLTSS program. Although the demand for LTSS services remains, regardless of the state's purchasing model, there are concerns among stakeholders that MLTSS programs may negatively impact certain types of LTSS providers, and/or force LTSS providers to significantly alter their business practices. What change managed care models have on the overall marketplace for LTSS providers is another key issue. The guidance anticipates that traditional LTSS providers will be impacted by managed care, and requires that states or MCOs help them make the transition successfully. 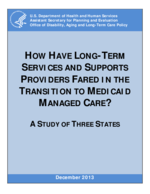 This study describes the impact of managed care models on traditional LTSS providers in three states that have adopted mandatory MLTSS statewide: Delaware, Tennessee and Minnesota. What was the impact of early implementer MLTSS programs on the case management organizations, HCBS care agencies, nursing homes and other LTSS providers that existed prior to implementation with respect to continued viability, volume of business, lines of business (diversification), payment rates, and investment in infrastructure and new organizational competencies? For providers that transitioned successfully to MLTSS, what were their greatest organizational challenges, and how did they meet them? What changes took place in the markets where MLTSS was implemented? Did traditional providers exit the market and/or merge with others? Did new providers enter the market? What, if any, innovative practices have emerged in the delivery of LTSS? In selecting states for our case studies, we had several criteria. We wanted states that had MLTSS programs with sufficient scale to have broad impact in the Medicaid LTSS sector. We also wanted all of the study states to have been implemented for at least one year prior to our visit, to allow sufficient time for impacts to be felt. We were interested in whether different impacts could be observed over time, so we selected three states with different implementation dates, spanning from 1997 in Minnesota to 2012 in Delaware. Finally, we wanted to include a mix of health plan types ranging from private MCOs to county-based purchasing (CBP) organizations in Minnesota. Our methodology included the collection of baseline descriptive information on the MLTSS programs in the study states, as well as exploratory interviews with state officials to gain co-operation for the study, and to learn about any current policy or political issues that might impact the study. We spent 3-4 days in each state interviewing LTSS providers and provider associations, MCOs, state officials and other stakeholders specific to each state. In Tennessee and Minnesota, we visited both a metropolitan area and a rural area. In-person visits were supplemented with telephone interviews and e-mail correspondence. Table 1 shows the number of interviews held in each state by type of stakeholder group. NOTE: The "Other" category includes: PACE (in Tennessee); an Area Agency on Aging (Tennessee); organizations that provide both residential and HCBS (Minnesota); health care systems that provide primary care and care coordination (Minnesota); a Critical Access Hospital (Minnesota); LTSS provider associations (Minnesota and Tennessee) and advocates (Delaware). The nursing home association in Delaware chose not to participate, rather the executive director notified members of the opportunity to meet with us (only one accepted). We identified key stakeholders for the interviews in a number of ways. As noted, we started with the Medicaid officials in each state and they gave us recommendations for groups to contact such as provider associations, traditional case management organizations, and, in some cases, individual providers. In two of the states, MCOs identified LTSS providers and reached out to them to explain the study and ask for their participation. We then followed up with providers and other stakeholders to answer any questions and schedule the interviews. We also got recommendations for other providers to interview while on-site. For each state, we conducted several phone interviews after the visit. We used a semi-structured interview protocol to ensure that we addressed our research questions, while allowing informants to provide unanticipated information. To encourage openness, informants were told that their input would be anonymous in study products. Two Truven Health staff conducted each interview, with one person leading the interview and the other taking notes. We analyzed notes for information addressing the four research questions, synthesized information across stakeholder groups and states. Table 3 compares the size of the MLTSS programs relative to the total Medicaid enrollment and Medicaid managed care enrollment across states. As shown, each of the MLTSS programs are relatively small as a share of the state's total Medicaid and Medicaid managed care enrollment. Minnesota's MLTSS programs combined represent the largest shares of total Medicaid and Medicaid managed care enrollments at 7% and 8%, respectively. Provided by the Delaware Division of Medicaid and Medical Management, August 2013. All figures are for July 2013. The Medicaid managed care enrollment figure does not include the state's Diamond State Partners program (enrollment of 2,170). For the Medicaid managed care and MSC+/MSHO enrollment statistics: Minnesota Department of Human Services, Minnesota Health Care Programs Managed Care Enrollment Totals, July 2013, accessed on August 23, 2013 at http://www.dhs.state.mn.us/main/idcplg?IdcService=GET_FILE&RevisionSelectionMethod=LatestReleased&Rendition=Primary&allowInterrupt=1&noSaveAs=1&dDocName=dhs16_177533. For the total Medicaid enrollment: Minnesota Department of Human Services, Reports and Forecasts Division, Monthly Medical Care Programs Enrollment Counts: Statewide and by County, Data for February 2013 as of July 2013, accessed on August 23, 2013 at http://www.dhs.state.mn.us/main/idcplg?IdcService=GET_FILE&RevisionSelectionMethod=LatestReleased&Rendition=Primary&allowInterrupt=1&noSaveAs=1&dDocName=dhs_id_016343. NOTE: This is the total number of enrollees identified as "nursing home certifiable" in the state's Medicaid managed care enrollment report. There are additional people living in the community who are not at this level of care (LOC) who use State Plan Home Care services such as personal care assistance and private duty nursing. For the total Medicaid managed care enrollment (which in Tennessee is the same as total Medicaid enrollment): TennCare, 2013 Enrollment Data, TennCare Midmonth Report for March, 2013, accessed on August 23, 2013 at http://www.tn.gov/tenncare/EnrollmentData/fte_201303.pdf. For total MLTSS enrollment, personal communication with Patti Killingsworth, TennCare Bureau. DSHP-Plus is authorized under a §1115 waiver, which expires in December of 2013. The state has submitted a request to CMS for a five-year extension. Enrollment in DSHP-Plus is mandatory for full benefit dual eligibles living in the community and all Medicaid recipients who are determined eligible for LTSS, with the exception of people receiving services through the state's waiver program for people with developmental disabilities and those who reside in an ICF-ID. The latter two groups are excluded from enrollment in DSHP-Plus. Other excluded groups include partial benefit dual eligibles (those for whom Medicaid only pays for Medicare cost-sharing and/or Part B premiums), persons enrolled in PACE and persons placed in out-of-state facilities. People who were enrolled in the state's AIDS waiver and its Aged and Disabled waiver prior to DSHP-Plus implementation were automatically enrolled in DSHP-Plus. The program was implemented as an add-on to Delaware's longstanding (17-year) mandatory Medicaid managed care program, DSHP. DSHP-Plus is operated by the two for-profit MCOs that were participating in DSHP at the time of the DSHP-Plus implementation: United Healthcare (UHC) and Delaware Physicians Care (owned by Aetna). Both serve the whole state. The state is in the process of preparing a competitive bid for the next procurement. DSHP-Plus is a statewide program and was implemented as such from the start (Delaware is a small state with only three counties). Enrollment as of July 2013 is 10,885, growth of about 1,100 people since implementation.7 The enrollment is split between "community-well" dual eligibles who are not receiving any LTSS (52%) and people using LTSS (48%). The state uses an auto-assignment process to enroll individuals into DSHP-Plus with set time periods during which individuals may change plans. The process takes into account the MCO affiliation of individuals' historic providers, including HCBS. There is an open enrollment period once a year. The state retains the function of conducting the initial LOC assessment with the MCOs providing the ongoing assessments and development of service plans. Prior to the implementation of DSHP-Plus, the State's Division of Services for Aging and Adults with Physical Disabilities (DSAAPD) provided case management for the state's HCBS waivers, with the exception of the AIDS waiver. Case management for the AIDS waiver was and still is provided by community-based organizations that specialize in this population. Their role was protected for the first year of program implementation and, to date, the MCOs have continued this arrangement. The transition of case management from DSAAPD to the MCOs was carefully planned and resulted in a significant reduction of staff for DSAAPD. Several of the staff went to work for the MCOs as case managers and others moved to different jobs with the state or retired. No individuals were forced out. Despite months of planning and ongoing communication between the Medicaid staff and DSAAPD, it was an anxious time for DSAAPD case managers and other staff who were unsure of where they would end up. After some MCO presentations, DSAAPD case managers concluded that the MCO case management positions compared unfavorably to their state positions for several reasons. For example, the MCO positions lacked the generous state benefits and office camaraderie; they did not offer flexible work schedules and there was a perception that MCOs were focused mainly on costs. However, both DSAAPD and the MCOs described some successful transitions of case managers after an initial period of adjustment. The DSHP-Plus LTSS service package includes services that the state provided through its AIDS waiver and Aged and Disabled waiver and some new and expanded services such as services for people living in assisted living, meals on wheels, home modifications and personal emergency response systems (PERS). Community "well" dual eligibles who do not need HCBS waiver-level services receive limited case management and the DSHP service package (which includes LTSS covered by the state plan such as home health and private duty nursing). Services carved out from both DSHP and DSHP-Plus include pharmacy, child dental, non-emergency transportation and day habilitation services authorized by the State's Division of Developmental Disabilities Services. DSHP-Plus was implemented 13 months after program design began.10 The state had an extensive communication strategy to educate major stakeholder groups about the program. State staff conducted over 60 presentations around the state and Webinars to inform stakeholders and address questions. The two MCOs also conducted a significant amount of outreach to providers on billing and other administrative matters, particularly HCBS providers who were not accustomed to billing electronically. Nursing homes in Delaware were the most vocally opposed to the program. To obtain their participation, the state protected Medicaid nursing home payment rates for the first three years of the program. The state has expanded the number of people receiving Medicaid-funded HCBS through the DSHP-Plus program. First, it eliminated the funding limits on services provided outside the state plan (i.e., meals, home modification and personal care attendants that had applied to the Aged and Disabled waiver by serving that population under §1115 authority). Second, the MCO assessment of a population new to managed care in the state--community well dual eligible--has identified more people who qualify for Medicaid-funded LTSS. Third, the benefit package has new and expanded HCBS. Further, DHSP-Plus has resulted in the expansion of participant-directed attendant care. This service was originally introduced in Delaware by DSAAPD as a waiver service, albeit a service financed with state funding only. When DSHP-Plus was implemented, the state added the service as a Medicaid-covered benefit. Both of the two state fiscal intermediaries reported a doubling of enrollment in this service since the program was implemented. In Delaware, we conducted our in-person interviews in the northern part of the state, in the Wilmington and New Castle areas. We also conducted phone interviews with home care providers who served the southern part of the state. Given Delaware's small size, most informants could speak to the statewide experience. The Tennessee CHOICES program is the component of Tennessee's overarching Medicaid Demonstration Program (TennCare) which provides LTSS to seniors 65 years of age or older and to persons with physical disabilities 21 years of age or older. Like TennCare, the CHOICES program operates under §1115(a) demonstration authority from CMS. Prior to the implementation of the CHOICES program, LTSS were carved out of the TennCare program, and were provided under a FFS model. CHOICES was added to the TennCare program through the authorization of the Long-Term Care Community Choices Act, which was passed unanimously by the Tennessee state legislature in 2008. It was originally implemented in July 2010 under a three-year agreement with CMS, and in 2013 was approved by CMS for another three years through June 30, 2016. The Tennessee Bureau of Long-Term Care, which administers the CHOICES program, contracts with three MCOs to operate the program. The three MCOs--UHC Community Plan, Volunteer State Health Plan (a subsidiary of Blue Cross Blue Shield of Tennessee), and Amerigroup--are the same managed care plans that were already contracted to manage the rest of the TennCare program, including physical and behavioral for persons with LTSS needs. LTSS was added to those existing contracts to create the CHOICES program. Two plans operate in each of Tennessee's three TennCare regions. UHC operates in all three regions--East, Central and West. Volunteer State Health Plan operates in the East and West regions. Amerigroup operates only in the Central region, which is the largest population center in the state. When the CHOICES program was initially implemented in 2010, persons receiving LTSS were already assigned to one of the two available plans in their region, through which they were receiving physical and behavioral health services. This eased the transition into CHOICES, since members began receiving LTSS through their existing plans. Similarly, an existing TennCare member who develops a need for LTSS receives LTSS services from his or her existing plan. New TennCare members (including those who need LTSS) are given a choice of plans at the time of application and are auto assigned if they do not make a selection. All new members are given 45 days to switch plans after their initial assignment and are also allowed to switch plans annually in a 30-day open enrollment period. Participants may also switch plans based on hardship criteria at any time. The CHOICES program is a comprehensive Medicaid managed care plan. CHOICES contractors are accountable for managing most of their members' Medicaid benefits, including LTSS, physical health and behavioral health services. Prescription drugs and Medicare cost-sharing are carved out of the capitated payment. Ninety percent of CHOICES members are dually eligible for Medicaid and Medicare, and receive their Medicare-covered services through the Medicare program. All three CHOICES contractors operate Medicare Advantage Plans or SNPs in Tennessee, enabling members to be enrolled in a companion Medicare plan. Of the entire TennCare membership, over 27,000 are dually- enrolled in companion Medicare Advantage plans, but the number of CHOICES members included among the 27,000 is not known.11 Persons of all ages living in nursing facilities are enrolled in the CHOICES program. CHOICES provides HCBS to people 65 years of age or older, and persons between 21 and 64 years of age with physical disabilities. Children with significant disabilities and persons with intellectual disabilities are not served through the HCBS component of the CHOICES program, and are served through other TennCare programs. In August 2013, there were about 32,100 persons receiving LTSS benefits through the CHOICES program. Prior to the implementation of the CHOICES program in 2010, persons received HCBS through a 1915(c) Medicaid waiver program. Case management services under the pre-existing program were provided by independent case management agencies under contract to the state. Under the CHOICES program, case management services (called care coordination in CHOICES) moved to the three MCOs, resulting in a significant shift in the case management function. Local Area Agencies on Aging and Disability, which served as operating agencies for the former 1915(c) waiver programs, continue to play a significant role in the operation of the CHOICES program, since they are responsible for facilitating Medicaid financial and LOC eligibility processes for new CHOICES applicants, and providing information and referral services about the CHOICES program to their local communities. As the availability of HCBS alternatives expanded rapidly in the initial years of the CHOICES program, the state also moved to tighten its criteria for nursing home admissions. In July 2012, the state instituted new LOC criteria for Medicaid nursing home coverage. Nursing home eligibility is now determined through the application of an acuity scale that rates the individual's functional deficits along a number of dimensions. In order to be eligible for nursing home care, a person must now achieve a rating of nine or higher on the scale of 26. The new criteria were applied to new nursing home and HCBS admissions only; persons already residing in nursing homes with an acuity score of less than nine were permitted to stay in the program. Also, persons with at least one significant functional deficit and an acuity score of less than nine are eligible for a more moderate package of HCBS and can still qualify for Medicaid coverage in nursing facilities through a state review process. Another policy objective of the CHOICES program is to increase the number of CHOICES members who elect to use a participant-directed service model for receiving LTSS services. Prior to CHOICES, participant-directed services were not available to people in the HCBS waiver programs for older persons or persons with physical disabilities. The managed care plans are contractually required to offer a participant-directed service option for certain services to all CHOICES members who are eligible to receive HCBS and are determined capable of self-directing their services. The state has also established targets for each MCO regarding the number of persons selecting the participant-directed services model, although these are only targets, as the selection of the participant-directed model is entirely a matter of consumer choice. Rather than have each MCO establish its own infrastructure for administering a participant-directed service model, the state has contracted with a fiscal employer agent (FEA) to administer the participant-directed model statewide, and MCOs are required to contract with the same FEA. CHOICES members who are eligible to receive HCBS are provided the opportunity to select their own direct service provider. Once a new member is enrolled in the program, an assessment is conducted and a plan of care (POC) is developed, and the MCO works with the member to implement the plan. The assigned case manager generally provides the member with a list of the providers in the MCO's network who are geographically accessible. Once the member selects his or her direct service provider, he or she contacts the provider to initiate services. A somewhat controversial component of the CHOICES program is its use of an Electronic Visit Verification (EVV) system. The state has mandated that all three MCOs select and contract with a vendor to implement an EVV system within specifications established by the state, and the MCOs all chose the same vendor. The purpose of the EVV system is to verify that direct service providers are providing services in accordance with the established POC. Once a POC is set up for a CHOICES member, the plan--which includes the daily schedule for provider visits--is entered into the EVV. Then, when a personal care attendant arrives at a participant's home to provide services, he or she calls into the EVV system, on the participant's phone, to verify that he or she has arrived on time, in accordance with the POC schedule. The attendant also calls into the system when he or she leaves the member's home to verify that he or she has stayed at the home for the allotted time. The system permits real-time monitoring and resolution of gaps in care. If a scheduled worker does not arrive and call into the system, an alert is generated to the provider and to the MCO, both of which are obligated to act immediately to resolve the gap in care. The EVV system is also linked to the claims processing system of each MCO, so that if there is a discrepancy between the data contained in the EVV system and the provider's invoice, the claim is rejected. During our site visit to Tennessee, we concentrated our provider interviews in the Memphis area, which is located in Shelby County. We also conducted a number of phone interviews with CHOICES providers in other areas of the state, who had been referred to us by their state associations. In Nashville, we interviewed representatives of two managed care plans as well as representatives of several provider associations and state program staff. Minnesota operates two MLTSS programs for persons who are 65 years and older, MSC+ and MSHO. Both include LTSS for members who need them. MSHO includes both Medicaid and Medicare services and was designed specifically to integrate services for dual eligible seniors. MSC+ is a Medicaid-only program that is open to seniors who have Medicaid coverage only, as well as those who have both Medicaid and Medicare. (Most dual eligible seniors in MSC+ receive Medicare services on a FFS basis.) MSC+ is a mandatory Medicaid managed care program. MSHO is a voluntary option for dually eligible seniors. Dual eligible seniors may choose MSHO when first eligible for Medicaid, or may switch to MSHO from MSC+ at any time, effective on the first day of the following month. Seniors who do not choose an option default to an MSC+ plan. Both programs evolved from Minnesota's Pre-paid Medical Assistance Program (PMAP), which began in 1983 in the Minneapolis-St. Paul metro area. The mandatory Medicaid managed care program included seniors and most other population groups. Primary and acute services were delivered by health maintenance organizations (HMOs). LTSS continued to be delivered on a FFS basis. Because PMAP did not include LTSS or Medicare, it managed only a portion of services used by seniors. Reorganize the health care service delivery system to support, rather than confound, sound clinical objectives; reduce administrative duplication and complexity; and create a seamless point of access for beneficiaries and participating providers. Control overall cost growth by providing incentives for efficient and economical intervention; changing utilization patterns; and reducing cost shifting between Medicare and Medicaid. In 1997, MSHO was launched as a demonstration program in the metro area. PMAP continued to be the mandatory default program for seniors, but dual eligible seniors in the demonstration service area could choose to enroll in MSHO instead. For the first several years of the program, MSHO attracted a minority of eligible seniors, with the majority enrolling in PMAP. In 2005, the senior population group was separated from PMAP due to longstanding concerns that the PMAP payment rates and program features did not reflect the specific needs of seniors. Two new programs were created. Minnesota Senior Care had a similar benefit structure to PMAP, with primary and acute care benefits. MSC+ added LTSS to the package. In 2009, MSC was phased out, making MSC+ the default program for all eligible seniors, and MSHO as the voluntary option for dual eligible beneficiaries. By 2010, both programs were offered in all of Minnesota's 87 counties. As of July 2013, 13,005 seniors were enrolled in MSC+ and 35,671 were enrolled in MSHO, for a total of 48,676 across the two programs.15 This represents about 90% of Medicaid-eligible seniors.16 25,297 MSHO members (71%) were certified to need LTSS in a community or institutional setting, while 7,306 (56%) of MSC+ members were certified to need LTSS. MSHO pre-dates MSC+, and was expanded to most Minnesota counties earlier than MSC+. Because all MSHO plans had become Medicare SNPs by 2006, the state and CMS were able to work with them on Part D implementation, and about 30,000 dual eligible seniors were passively enrolled into MSHO as part of the transition. MSHO captured a large majority of eligible seniors at that time, and has maintained an enrollment advantage ever since. Services included in Capitation All Medicaid state plan and HCBS waiver services, including 180 days of Medicaid nursing home. All Medicaid state plan and HCBS waiver services including 180 days of Medicaid nursing home. All Medicare Parts A, B and D services. Both programs include all LTSS provided to seniors, including state plan services and HCBS waiver services. The MCOs are responsible for 180 days of Medicaid nursing home days per member, after which payments revert to FFS. Services provided to people in assisted living facilities (ALFs) are covered under the HCBS waiver under the name "customized living." The difference between the two programs is that MSHO includes Medicare and MSC+ does not. MSHO operates under 1915(a) and 1915(b) authority for Medicaid, and SNP authority for Medicare. MSC+ operates under 1915(b) and 1915(c) authority. Prior to 2005, the state used HMOs exclusively to provide MSHO and PMAP. In 2005, the Minnesota Legislature authorized CBP, which gave counties the option to receive capitated Medicaid payments from the state rather than have private MCOs operating the programs in their counties. As of July 2013, there were three CBP entities, two of which represented multiple counties. MSC+ was offered through CBP entities in 24 counties and MSHO in 21 counties (roughly a quarter of Minnesota's 87 counties). In the remaining counties, the state contracts with five HMOs for MSHO and MSC+. Four of the MCOs are private and one is a public, county-owned MCO that competes with the private MCOs for membership. The MCOs cover the majority of counties in the state, including the metro area, and have a substantial majority of members in both programs. The same eight plans (five MCOs plus three CBP entities) operate both programs. They have Medicaid contracts with the state for MSC+ and MSHO, and Medicare Advantage SNP contracts with CMS for MSHO. In all but seven counties, beneficiaries may choose from among the same plans for either MSC+ or MSHO. In the remaining seven counties, certain plans offer one program but not the other. The number of plans offered to seniors ranges from four in a ten-county region surrounding Minneapolis-St. Paul, to one in 25 rural counties. In a majority of counties, seniors have a choice of 2-3 plans for each program. For this study of LTSS provider impacts, we visited two contrasting regions. We visited the metro area, which has had HMO-based MLTSS since 1997 and has the most dynamic health care market in the state. We also visited a six-county area in Western Minnesota that is served by a CBP entity. Through the CBP, the rural counties implemented MSC+ in 2005, and MSHO in 2006. Our findings are organized by the research questions identified in the Introduction. A few important caveats should be noted. First, the findings are based on the impressions of key informants, comprised primarily of LTSS providers, MCOs, and state officials. To increase confidence in the results, we included only observations that were reported by more than one informant. Second, the states implemented confounding LTSS policy changes during the study period, and informants may have associated the policy changes with managed care implementation. Examples of this are Tennessee's recent implementation of stricter nursing home LOC criteria and Minnesota's tightening of rules for personal care assistance. To mitigate the possibility that impacts from policy changes would be misattributed to managed care, we specified at the beginning of each interview that we were interested specifically in managed care impacts, and we routinely prompted informants to consider whether the issues they described were mainly driven by MLTSS, or other factors. We met with traditional Medicaid LTSS providers and their professional associations to determine how they had been impacted by the transition to MLTSS. By traditional provider, we mean any LTSS provider that had been participating in the Medicaid program prior to implementation of MLTSS. These included case management agencies, HCBS agencies and nursing homes. We asked about impacts in several areas, including: (1) continued viability; (2) volume of business; (3) diversification of business; (4) payment rates; and (5) investment in infrastructure and new organizational competencies. Most HCBS providers continued to be viable after managed care implementation, but experienced increased administrative costs and cash management pressures. Many HCBS providers reported that scale became increasingly important in a managed care environment, due to increased administrative requirements. Reported benefits of scale include the ability to spread billing and other administrative functions across a broader base of customers, and the ability to accept new referrals in accordance with the schedules specified in care plans. Several informants reported knowing of small agencies that had merged or wanted to merge with larger agencies. Virtually all traditional HCBS providers were offered contracts to participate in MCO networks when MLTSS was initially implemented. In all three study states, MCOs offered contracts to virtually all qualified traditional providers. MCOs reported that they needed as many traditional HCBS providers as they could get in order to meet network adequacy requirements, and in Delaware and Tennessee, nursing homes had acquired "any willing provider" protections prior to implementation. MCO panels for home-based services providers remain open in Delaware (one year post-implementation). MCOs have recently closed panels for some types of home-based services providers in Tennessee (three years post-implementation), and at least two MCOs in Minnesota recently closed their panels in certain counties (15 years post-implementation). Traditional case management providers became obsolete in states where MCOs decided to perform the function internally. In Delaware and Tennessee, case management services for LTSS had been provided by state personnel and private agencies, respectively. The impacted agencies had to reduce staff, some of whom were recruited to work for the MCOs. An exception in Delaware was made for the agencies that provide case management in the AIDS waiver. The state required MCOs to contract with these entities for the first year of the program to provide case management to this population. At the time of our site visit (14 months post-implementation), these contractual arrangements were still in place. In Minnesota, where counties traditionally provided case management for HCBS waiver participants, most MCOs contracted with counties to continue performing the function. However, some Minnesota MCOs have also developed internal capacity, and contracted with large care systems (e.g., Fairview Partners, Essentia) to provide case management for members who were already affiliated with those care systems. Nursing homes were negatively impacted by managed care and viability was mixed, depending on ability to diversify. Most nursing homes reported a reduction in Medicaid days in the wake of managed care, though many observers pointed out that states have been implementing multiple policies to reduce Medicaid days, and managed care was just one of several strategies being employed. Some reported a decline in their occupancy rates, while others said that increased Medicare skilled days had offset reductions in Medicaid days. Others had diversified into assisted living, and noted that consumer preference was a greater force in that direction than managed care. In Delaware and Tennessee, nursing home associations advocated successfully for "any willing provider" provisions, which guarantee that for specified periods of time, qualified nursing homes be offered contracts by all participating MCOs. The volume of case management increased in all three states, but the function moved from traditional agencies to MCOs in two of the three states. Volume of case management went up for different reasons across the states. In Delaware and Tennessee more people became eligible for LTSS when managed care was implemented. In Minnesota, case management was expanded from primarily waiver participants to all members, expanding the scope of case management. Traditional case management agencies did not benefit from the expansion in Delaware or Tennessee because the MCOs took over the function. In Minnesota, MCOs contract with traditional organizations (counties), and also use alternative approaches (contracting with care systems and conducting some case management directly). The growth in volume in Minnesota appears to have been sufficient to accommodate both traditional and new ways of delivering case management. The volume of Medicaid nursing home days has decreased. As noted earlier, nursing home days have gone down in all three study states, though the impact related specifically to managed care is difficult to gauge, given other policy initiatives including Money-Follows-the-Person, Aging and Disability Resource Centers and tightening of nursing home LOC criteria. Diversification of business among traditional LTSS providers was evident in Minnesota but may be attributable to broader market dynamics. Providers in Delaware and Tennessee were focused primarily on strategies for maintaining and growing their core businesses. Tennessee attempted to stimulate diversification among nursing homes with about $3 million in diversification grants, but to date, nursing homes there remain focused primarily on their traditional business. In Minnesota, many providers reported that they had diversified into new lines of business. Examples include one nursing home provider that now offers home care and assisted living. Another example is a residential provider that has diversified into transitional care units (used to avoid hospital admissions) and in-home primary care. The health care market in Minnesota is very dynamic. Many of the providers we interviewed noted that Minnesota has already spawned multiple accountable care organizations (ACOs), and providers of all types want to be large and diverse enough to become ACOs or at least participate in them on a shared savings/shared risk basis. As one provider put it, "LTSS providers are trying to get higher up in the food chain." In other words, they want to be integral to ACOs and share incentives with them. Medicaid rates paid by MCOs to LTSS providers were mixed relative to FFS rates. In Tennessee, MCOs have paid providers the FFS rate as required by the state. Some providers argued that this amounts to a decrease in payment, because their administrative costs have gone up, but in terms of dollars paid, the MCOs pay the FFS rate. In Delaware and Minnesota, there was no detectable pattern to the rates reported by informants. Some reported receiving a higher rate than FFS, while others said they were paid less. In general, this was not considered a big issue by most providers, who noted that Medicaid FFS rates have always been low, and the introduction of managed care has not significantly impacted rates either way. Some Minnesota MCOs have risk sharing payment arrangements with integrated care systems. From the beginning of MSHO, some MCOs have sought risk arrangements with large care systems that typically include primary, acute and LTSS in vertically integrated systems. Payment arrangements vary from full risk for all services to capitation for case management only, with shared savings for other services. It is important to note that Minnesota was an early managed care state, and risk arrangements with providers have always been part of the equation there. All three states are pursuing payment reform in partnership with MCOs and providers. Tennessee is developing provider-level quality measures that can be tied to variable payment rates, and Minnesota recently issued a Request for Responses to its MCOs seeking proposals for Integrated Care System Partnerships (ICSP), which it defines as contracting arrangements that include risk sharing or shared savings, performance-based payments or other payment reforms tied to financial performance and state-approved quality metrics. At the time of our visit, Minnesota had received 30 responses from its eight MCOs. Delaware has begun working with its MCOs and providers to develop payment reform initiatives. There was limited evidence of investments in Information Technology, but it was difficult to attribute it to managed care. For example, Tennessee implemented an EVV system simultaneously with managed care, and LTSS providers must participate in the system in order to be paid. However, EVV is not dependent on managed care. It can be implemented in FFS systems. In Minnesota, at least one MCO is working with a county to pilot an electronic case management system. Several providers reported a need to beef up their capacity for electronic billing. Although most had been submitting claims electronically to the state prior to managed care, providers needed to become more proficient at tailoring their claims to the individual specifications of each MCO and, in the case of Tennessee, to resolving exceptions that occur when claims were inconsistent with what had been authorized in the care plan and monitored through the EVV system. We asked informants what the greatest challenges were for LTSS providers during the transition from FFS to managed care, and how the challenges were addressed. In general, informants described an environment in which key business processes simultaneously changed and increased in complexity, increasing transaction costs. Providers must interact with a greater number of parties in managed care, increasing transaction costs. In the traditional FFS system, providers were accustomed to interacting with one entity (the county or state) for purposes of contracting, service authorization and payment. Under managed care, providers in most service areas must interact with at least two MCOs, each of which has its own specific requirements for credentialing, service authorization and billing. The provider must learn the nuances of each payer in order to transact business successfully. This adds complexity to functions (such as billing) which had been uniform in the traditional system. Furthermore, when problems arose, it was often unclear to providers how to resolve them, since they had not yet developed relationships or experience with the MCOs. Billing issues are pervasive. LTSS providers in all three states reported problems with billing practices. Each MCO has its own specific requirements for billing, and often those requirements only become clear through a trial and error process of submitting claims, having them rejected, and resubmitting them. Providers in Delaware, the "youngest" program, spoke in greater detail about billing problems compared to providers in the other two states. This likely reflects the fact that Delaware providers are closer to the transition period when billing problems tend to be most pronounced due to the learning curve for all parties. But, providers in the more established programs in Tennessee and Minnesota also described billing as an ongoing frustration, suggesting that aspects of this process can be a longstanding challenge. Many LTSS providers reported that the number of outstanding claims had increased. Reports on the timeliness of MCO payment on clean claims were mixed. Several providers said that MCOs provided payment more promptly than the state on clean claims. However, in Delaware there was generally agreement that claims payment had been much faster in the FFS system (7-10 days as compared to two weeks or longer by the MCOs). Regardless, because the number of problem claims went up under managed care, providers were at risk for a greater amount of accounts receivable at any given time. The early transition to MLTSS was particularly susceptible to billing problems. Providers, MCOs and state officials described several billing problems that were specific to the transition period. Most stemmed from the unique features of Medicaid-funded LTSS as compared to health and acute care services. For example, in Delaware, MCOs had not entered certain LTSS procedure codes into the system, leading to denials of those claims. A provider of participant-directed LTSS noted that the MCOs' billing systems did not recognize "atypical" National Provider Identifiers. Specific to dual eligibles, the MCOs' billing systems in one state initially denied Medicaid LTSS claims that were not accompanied by a Medicare denial, despite the fact that these were claims for Medicaid-funded HCBS, and not Medicare-covered services. It took some education and time for the MCOs to reconfigure their billing systems to correctly process LTSS claims. LTSS providers reported that service authorizations take longer in managed care. This was reported both for Medicaid services and, in the case of MSHO, Medicare services. In general, providers described service authorization in managed care as less timely than what they had experienced in FFS. In some cases, providers described MCOs' approval processes as more bureaucratic than the entity they were dealing with in FFS (e.g., the state or county). As an example, one home care provider described a lengthy process requiring the MCO's case manager to submit the service request to the medical review unit, and then the prior authorization unit. In that case, the case manager did not have authority to approve home care services. In the FFS system, providers in this state would have started services before getting an authorization; they had a level of trust in the traditional case management agency to honor the claims. But, in managed care, they would not take that risk. It was providers' experience that they might not get paid by the MCOs if the service was not authorized before it was delivered. Whereas they could see a new referral within 24 hours in the FFS system, it could several days to set up an initial visit in managed care. As with billing, some providers experienced transition-specific problems related to service authorizations. This problem was specifically regarding service authorizations that had existed in FFS and were supposed to carry over from the old system to managed care. Some providers reported that they were not given authorization codes for such services, the codes had been "dropped" from the MCOs' systems, or the codes they were given were for incorrect amounts of service. Certainly, state officials and other stakeholders in all three states recognized that billing was going to be a major issue in the transition from FFS to managed care, and each state required MCOs to participate in a considerable amount of training on billing issues prior to and during the program implementation. One MCO in Delaware reported visiting 50 LTSS providers in person prior to program implementation and continuing to meet frequently with providers to help them with billing and other issues. Despite these efforts, the level of concern providers expressed suggests the preparation was not sufficient. In one state, providers noted that the training was not detailed and they did not have access to comprehensive billing manuals prior to implementation. In the other two states, there appeared to be substantial effort in helping providers learn how to bill, and MCOs provided free clearinghouses through which providers could submit claims. All three states require MCOs to designate provider liaisons, so that providers know where to go when they have problems and can develop a working relationship over time. For the most part in Delaware and Minnesota, providers considered MCO provider liaison staff to be helpful, though not always sufficiently knowledgeable to address the problem (particularly if it related to billing). In Tennessee, providers cited high turnover in MCO staff as a factor in making it difficult to develop relationships and solve problems. MCOs described making concerted efforts to help providers after the transition. For example, some closely monitored claim submissions to make sure smaller providers were submitting claims and then reached out to those who were not. (This process was required by the State of Tennessee.) They also described instances of cutting checks for small providers with very thin margins while claims issues were being resolved. In this section we report findings on the impacts that MLTSS program have had on the overall market for LTSS services at the provider level. We include the caveat that while we observed many changes in the LTSS provider market, it is not possible to attribute all of the changes to the implementation of MLTSS models. Markets change constantly in response to numerous influences, and in all three states, the adoption of MLTSS models was but one change implemented by state Medicaid programs to improve the administration of LTSS services. So while we report findings on observed changes in the LTSS marketplace, readers should be cautious in attributing observed changes directly to the implementation of MLTSS programs. Transitional provisions have served to preserve existing LTSS providers in the initial shift from FFS models to MLTSS models. These include any willing provider provisions for nursing homes in Delaware and Tennessee, and continuity of care provisions that require MCOs to pay existing HCBS providers for services delivered under authorizations that were transferred from the FFS program. The need to pay for previously existing authorizations required MCOs to identify existing providers and begin a relationship with them which, in most cases, evolved into network contracts. In Minnesota, MCOs worked closely with counties, the traditional case management entities, to identify and contract with the counties' existing networks of providers. Virtually all traditional LTSS providers in all three states had contracts with the MCOs in their service areas, and the initial MLTSS market looked very much like the traditional market. In all three states, the implementation of MLTSS programs has resulted in an increase in demand for and supply of HCBS, and contributed to reduced demand for nursing home services. MLTSS models have aligned financial incentives between states and MCOs, such that MCOs are motivated to serve the LTSS needs of their members in HCBS settings, whenever possible. In Tennessee, where the HCBS market had more than doubled over a three-year period, there has been substantial growth in the number of HCBS providers, particularly Personal Services and Supports Agencies (PSSAs). In Memphis, where we conducted our site visit, there had been a large number of new entrants into the PSSA market over the last three years. While the demand for Medicaid nursing home days has declined, nursing home providers had generally adapted by seeking other revenue sources. In Delaware and Tennessee, nursing home providers were seeking to increase their Medicare lines of business to make up for declining Medicaid revenues. In Minnesota, many nursing home organizations had diversified into other lines of business, such as ALFs. It should be noted, however, that Minnesota informants attributed this market shift to changing consumer demand in the private sector, and noted that it had begun prior to wide-scale adoption of MLTSS. In both Delaware and Tennessee, the implementation of MLTSS programs has led to the increased use of participant-directed service models by LTSS participants. Participant-directed care models increased because the MCOs in those states were contractually required to offer participant-directed services as a care option to their members. In addition, expanded infrastructure had been put into place, concurrent with MLTSS program implementation, to administer participant-directed benefits. Both states consciously employed the structure of their MLTSS programs to increase the use of participant-directed service models in their LTSS systems. While few LTSS providers have gone out of business to date, after the implementation of MLTSS programs, many providers believe that the key to long-term survival is scale. Larger providers, with more financial resources, will be better equipped to adapt to managed care and other market phenomena, such as the evolution of ACOs. In Minnesota, which had the most mature MLTSS market of the three states, LTSS providers were aggressively trying to grow in scale as well as expand into non-LTSS lines of business, including primary care and transitional care services. Large LTSS providers in Minnesota reported getting frequent inquiries from smaller providers about the possibility of becoming acquired. Scale is critical to meeting the increased administrative costs related to managed care, investing in technology and ensuring sufficient cash flow. It also makes providers more attractive to MCOs and ACOs for purposes of shared risk arrangements and for showing system capacity. There was some, but limited expansion, of LTSS provider types under MLTSS models. States used the shift to MLTSS models as an opportunity to add some new benefits to their repertoire of HCBS. However, the expansions were relatively small. Additional benefits added under MLTSS programs included respite care, pest control services, PERS, and home modifications. These added benefits required MCOs to negotiate provider contracts, and oversee service plans for non-traditional LTSS services, but did not lead to major changes in the marketplace. For example, MCOs contracted with companies that provide PERS to the private market, such that these companies were able to expand into the Medicaid market for their products and services. States were hoping to use MLTSS models to expand the availability of new 24-hour care residential models other than nursing facilities. In Minnesota, the most mature MLTSS market, significant progress had been made towards this goal. In the less mature markets of Tennessee and Delaware, little or no progress had been made. The financial incentives of MLTSS models encourage MCOs to develop lower cost alternatives to nursing homes for persons who require 24-hour care and/or supervision, and all three states would like to see expansions in these types of providers in their LTSS markets. In Minnesota, MCOs had been successful in expanding the availability of assisted living beds for their MLTSS members by 60%, but this increased capacity came slowly. In Tennessee and Delaware, both the states and the MCOs saw the benefit of expanding new 24-hour residential alternatives, but had encountered many regulatory and financial barriers in their efforts to do so. One rationale for MLTSS is that it provides greater flexibility to respond to changing needs in the system, and MCOs have incentives to innovate when doing so is cost-effective. Although we found several examples of innovation (described below), we found that MLTSS programs are fairly prescriptive. MCOs must comply with detailed contracts that leave very limited room for innovating with processes or services. Despite these limitations, we found the following examples of innovation in MLTSS, most of which were observed in Minnesota, the most mature of the MLTSS markets we visited. Risk-based payments to providers. Several large care systems in Minnesota have entered into various types of risk arrangements with MCOs. These range from taking risk for case management only to full risk for all services. The state is encouraging more movement in this direction with a recent Request for Responses issued to MCOs for ICSPs between MCOs and providers. LTSS residential providers (including nursing homes, assisted living, memory care, and multi-level campus settings) adding primary care to their settings. This enables the providers to improve access to primary care for residents who would otherwise not get to the doctor every six months. It should be noted that this innovation may be driven by MSHO in particular, an integrated Medicare and Medicaid program. Delegation of case management to care systems. Care systems with large primary care clinics are assuming responsibility for case management of members who already use the system for primary care. Case managers are assigned to a large clinic or a group of smaller clinics, and have good access to primary care physicians for purposes of integrating primary care and LTSS. MCOs making community grants. One MCO has made grants to a transportation agency to purchase vehicles and to sponsor specified routes. Another has provided equipment to providers to enable telehealth. Stimulating supply of needed services. One MCO has approached a provider about developing geri-psych capacity. Other plans pre-pay providers for geri-psych consultation time to ensure it is available for emergencies, such as a behavioral episode that places a resident's customized living arrangement at risk. Improving the EVV system. In Tennessee, one MCO has proposed partnering with a large home care agency to test a new EVV system that would be based on GPS technology, rather than using consumers' home phones. Workforce development. Another Tennessee plan conducted a pilot with the College of Direct Support to pilot on-line modules for workers. In-depth training sessions for traditional LTSS providers regarding billing practices are essential. Optimally LTSS providers would participate in practice sessions with each MCO to become proficient in its specific billing requirements. It is incumbent on states to review MCOs' accounts payable to their network LTSS providers, including the time it takes to resolve outstanding disputes for rejected claims, as part of their program monitoring approach. States could use financial penalties in their MCO contracts for failure to resolve claim disputes with their LTSS providers in a timely manner. LTSS providers will need to consider both short-term financial viability after the transition to MLTSS and a long-range business strategy, and not confuse the two. While states have adopted policies to protect traditional LTSS providers over the short term, over the longer term, MCOs will purchase LTSS services from providers where it makes the business sense to do so. From the interviews conducted in this study, it appears that small providers of HCBS will have increasing difficulty surviving over the long-term in the MLTSS marketplace. Related to the observation above, LTSS providers need to consider business strategies that will make them critical to the business success of the MCOs. An HCBS provider that provides multiple service types will be more critical to an MCO than a provider which only provides a single service. For example, an HCBS provider may consider expanding into managing home modifications, or pest control services, or PERS as a way of increasing its value to the MCO. It is unclear whether the shift to large-scale provider systems that can share risk with purchasers is a Minnesota-specific phenomenon, or a broader trend will spread to other states. Minnesota has always been an incubator for new health care financing and insurance arrangements, so the LTSS impacts observed in Minnesota may remain specific to that state. States are using MLTSS models as a tool for making their LTSS systems more consumer-directed. This includes increasing access to participant-directed service models and giving consumers increased control over exactly how and when they receive authorized services. States and MCOs are also moving towards the development of quality-rating systems for LTSS providers, so that consumers can choose their LTSS providers based upon objective measures of quality. MCOs in MLTSS programs will increasingly be looking for HCBS providers who can guarantee access to a well-trained, reliable, and stable workforce of personal care attendants that can meet the service needs of their members. LTSS providers that develop the human resource systems that are able to attract and retain this kind of workforce will be well positioned in the MLTSS marketplace. In our study of how LTSS providers have fared in the transition from a Medicaid FFS to a managed care environment in three states, we found that most traditional providers remained viable businesses under managed care, but did need to adapt their practices to meet a more complex business environment. A notable exception in Delaware and Tennessee was case management, which shifted from traditional organizations to MCOs. In Minnesota, a variety of case management models have emerged, and most counties continue to provide case management through contractual relationships with MCOs. State Medicaid staff and MCOs put forth considerable effort to plan for and ease the transition for LTSS providers. Despite these efforts, the transitions have created challenges for LTSS providers, particularly smaller providers that do not have the administrative resources to adapt quickly and absorb increased transaction costs. The experience in Delaware, Tennessee and Minnesota suggests that, with the exception of case management agencies, traditional LTSS providers continue to play a vital role when states transition from FFS to managed care. MCOs need the traditional providers in order to meet network adequacy standards and are likely to offer contracts to all qualified providers. The greatest challenge for traditional providers is adapting their business practices to a new set of payers, and sustaining additional administrative costs over time. Burwell, B., Kasten, J. (May 2013). Transitioning Long-Term Services and Supports Providers into Managed Care Programs. For the Centers for Medicare and Medicaid Services, Disabled and Elderly Health Programs Group, Contract #HSM-500-2011-000011, Task Order No. 0003. http://www.medicaid.gov/Medicaid-CHIP-Program-Information/By-Topics/Delivery-Systems/Downloads/Transitioning-LTSS-.pdf. Accessed May 23, 2013. This report identifies some of the business challenges faced by the LTSS provider community in transitioning from a FFS system to a MLTSS system. The findings of the study are based on qualitative interviews conducted with a variety of stakeholders, including state Medicaid program officials, representatives from managed care companies, LTSS providers, LTSS provider associations, and private consultants. The report also highlights some "best practices" in the provision of technical assistance to LTSS providers during the transition process. Centers for Medicare and Medicaid Services. (2013). Guidance to States Using 1115 Waiver Demonstrations or 1915(b) Waivers for Managed Long Term Services and Supports Programs. http://www.medicaid.gov/Medicaid-CHIP-Program-Information/By-Topics/Delivery-Systems/Downloads/1115-and-1915b-MLTSS-guidance.pdf. Accessed September 24, 2013. This guidance shares best practices CMS has learned from states, stakeholders, and advocates for establishing and implementing MLTSS programs. It also clarifies expectations of CMS from states using section 1115 demonstrations or 1915(b) waivers combined with another LTSS authority in an MLTSS program. CMS lays out the ten key elements that CMS expects to see incorporated into new and existing state Medicaid MLTSS programs. Crum, R. (2009). Minnesota's Senior Health Options Integrates Long-Term and Acute Care. Robert Wood Johnson Foundation. http://www.rwjf.org/content/dam/farm/reports/program_results_reports/2009/rwjf70202. Accessed August 2, 2013. This Program Results Report addresses the development of the MSHO program within the context of grants from the Robert Wood Johnson Foundation. It describes the MSHO program, as well as results and lessons learned to date. Lessons learned includes the need to: identify physician champions to provide leadership to other physicians; be persistent and patient given the lengthy planning process and determine the readiness of key stakeholders and the overall state environment (culturally and politically) for an integrated program. Delaware Health and Social Services, Division of Medicaid and Medical Assistance, Diamond State Health Plan Plus. (November 22, 2011). http://www.dhss.delaware.gov/dmma/files/dshpplus_ppt.pdf. Accessed August 5, 2013. This is a Delaware Health and Social Services presentation to stakeholders on the features of DSHP-Plus (developed prior to implementation). Delaware Health and Human Services, Division of Medicaid and Medical Assistance, Diamond State Health Plan Plus. (May 2011). Concept Paper for a Waiver Amendment Request Submitted Under Authority of Section 1115 of the Social Security Act to CMS/HHS. http://www.dhss.delaware.gov/dmma/files/dshpplus_conceptpaper.pdf. Accessed August 5, 2013. This is the State of Delaware's Concept Paper submitted to CMS prior to submission of the Section 1115 Demonstration Waiver Amendment that included DSHP-Plus. Mahaney, R., Owen, L.A., Jackson, B., Mayeri, M., Sowers, M. (September 11, 2012). Medicaid Managed Long-Term Services and Supports: Opportunities for Innovative Program Design. http://www.nasuad.org/documentation/hcbs_2012/HCBS%202012%20Presentations1/HCBS%202012%20Presentations1/Tuesday/1030/Lincoln/MLTSS%20Presentation%2009072012%20upd%203%2050p.pdf. Accessed September 24, 2013. This presentation describing two state Medicaid MLTSS programs took place at the 2012 NASUAD HCBS conference. It describes the Delaware DSHP-Plus program and Louisiana's Behavioral Health Partnership. Saucier, P., Burwell, B., Halperin, A. (August, 2013). Consumer Choices and Continuity of Care in Managed Long-Term Services and Supports: Emerging Practices and Lessons. http://www.aarp.org/health/medicare-insurance/info-08-2013/consumer-choices-and-continuity-of-care-AARP-ppi-ltc.html. Accessed August 29, 2013. The shift to managed care has raised concerns among stakeholders that LTSS will be interrupted during the initial transition to managed care and that services will be reduced over time as managed care contractors seek to lower costs. Stakeholders also have concerns about losing access to their providers. Recent managed care transitions in Kansas, New York and Wisconsin were studied. The authors found that little changed for consumers during the transition period, and services were not disrupted. The findings are limited to the transition period studied. Saucier, P., Kasten, J., Burwell, B., Gold, L. (July 2012). The Growth of Managed Long-Term Services and Supports (MLTSS) Programs: A 2012 Update. http://www.medicaid.gov/Medicaid-CHIP-Program-Information/By-Topics/Delivery-Systems/Downloads/MLTSSP_White_paper_combined.pdf. Accessed September 24, 2013. Between January and June 2012, Truven Health Analytics conducted a national environmental scan of Medicaid MLTSS programs for the Disabled and Elderly Health Programs Group at CMS. The scan included an inventory of all MLTSS programs that had been implemented as of June 2012 and a projection of future programs through January 2014. A key finding was that MLTSS grew significantly between 2004 and 2012. The number of states with MLTSS programs doubled from eight to 16, and the number of persons receiving LTSS through managed care programs increased from 105,000 to 389,000. By 2014, the number of states projected to have MLTSS programs is 26 (based on states that have actually completed planning documents and submitted formal proposals or waiver applications to CMS). The following data was provided by the TennCare Bureau. SOURCE: TennCare claims data reported in e-mail correspondence from Patti Killingsworth dated September 2, 2013. The share of older adults enrolled in the state's Medicaid program who were living in a community or Elderly waiver setting (vs. a nursing facility setting) increased from 39% in 1996 to 74% in 2012. Most of this increase was due to significant growth in the number of people enrolled in the Elderly waiver, from 4,726 in 1996 to 21,565 in 2012. The share of older adults enrolled in the Elderly waiver over this time period increased from 9.5% to 39.2%. SOURCE: Truven Health Analytics analysis of Minnesota Department of Human Services provider enrollment and encounter claims data.NOTES: The numbers of providers found in paid encounter claims may understate the numbers in paid managed care claims because some claims for Elderly Waiver services provided through managed care were processed by Minnesota Department of Human Services Medicaid management information system as a Third Party Administrator. However, these "TPA" claims are included in the analysis of units paid. The time periods for the measures based on units paid were SFY 2008 and SFY 2012. Saucier, P., J. Kasten, B. Burwell and L. Gold. (2012). The Growth of Managed Long Term Services and Supports (MLTSS) Programs: A 2012 Update. Centers for Medicare and Medicaid Services. http://www.medicaid.gov/Medicaid-CHIP-Program-Information/By-Topics/Delivery-Systems/Downloads/MLTSSP_White_paper_combined.pdf. Accessed August 8, 2013. Centers for Medicare and Medicaid Services. (2013). Guidance to States using 1115 Demonstrations or 1915(b) Waivers for Managed Long Term Services and Supports Programs. http://www.medicaid.gov/Medicaid-CHIP-Program-Information/By-Topics/Delivery-Systems/Downloads/1115-and-1915b-MLTSS-guidance.pdf. Accessed May 21, 2013. Burwell, B., and J. Kasten. (2013). Transitioning Long Term Services and Supports Providers into Managed Care Programs. Centers for Medicare and Medicaid Services. http://www.medicaid.gov/Medicaid-CHIP-Program-Information/By-Topics/Delivery-Systems/Downloads/Transitioning-LTSS-.pdf. Accessed August 8, 2013. The state-operated an integrated MLTSS program for people with physical disabilities under the age of 65, Minnesota Disability Health Options, from 2001 to 2010. Delaware Health and Social Services, Division of Medicaid and Medical Assistance, Diamond State Health Plan Plus. As of November 22, 2011, http://www.dhss.delaware.gov/dmma/files/dshpplus_ppt.pdf. Accessed August 5, 2013. Delaware Health and Human Services, Division of Medicaid and Medical Assistance, Diamond State Health Plan Plus Concept Paper for a Waiver Amendment Request Submitted Under Authority of Section 1115 of the Social Security Act to the Centers for Medicare and Medicaid Services, U.S. Department of Health and Human Services, May 2011. http://www.dhss.delaware.gov/dmma/files/dshpplus_conceptpaper.pdf. Accessed August 5, 2013. An undated state PowerPoint presentation clarifies that the 90% figure is based on Medicaid LTSS spending without intermediate care facility for persons with intellectual disabilities (ICF-ID) and the state's waiver for persons with developmental disabilities. These two populations are excluded from DSHP-Plus. The enrollment at implementation is based on Medicaid Managed Long-Term Services and Supports: Opportunities for Innovative Program Design, Rosanne Mahaney, Lou Ann Owen, Brenda Jackson, Meredith Mayeri and Mary Sowers, September 11, 2012. Current enrollment provided by Delaware Division of Medicaid and Medical Assistance. CMS Comprehensive Special Needs Plan Enrollment Report, July 2013. http://www.cms.gov/Research-Statistics-Data-and-Systems/Statistics-Trends-and-Reports/MCRAdvPartDEnrolData/index.html. Accessed August 5, 2013. UHC has an Institutional SNP in Delaware. However, information is not available on the number of members of that SNP who are also in UHC for DSHP-Plus. DSHP-Plus Program Timeline. http://www.dhss.delaware.gov/dhss/dmma/files/dshpplus_timeline.pdf. Accessed August 5, 2013. Correspondence from Patti Killingsworth, Assistant Commissioner, Bureau of TennCare. September 2, 2013. Delaware looked to Tennessee as a model for their arrangement with nursing homes. The Robert Wood Johnson Foundation. (2009). Minnesota's Senior Health Options Integrates Long-Term and Acute Care. http://www.rwjf.org/content/dam/farm/reports/program_results_reports/2009/rwjf70202. Accessed August 2, 2013. Minnesota Department of Human Services. (2013). Minnesota Health Care Programs Managed Care Enrollment Totals, July 2013. http://www.dhs.state.mn.us/main/idcplg?IdcService=GET_DYNAMIC_CONVERSION&RevisionSelectionMethod=LatestReleased&dDocName=dhs16_141529. Accessed July 22, 2013. At any given time, about 10% of eligible seniors are receiving Medicaid services on a FFS basis. These include "partial dual eligibles" (qualified Medicare beneficiaries and specified low-income Medicaid beneficiaries), persons transitioning into Medicaid who must wait until the first of the month to enroll in managed care, persons on community medical spend-down, persons with cost-effective private insurance and persons in a few other exception categories. Minnesota's Alternative Demonstration for People with Medicare and Medicaid: Special Needs Plans and Integrated Care System Partnerships. PowerPoint presentation given by Pamela Parker at the 2013 Age and Disabilities Odyssey, June 18, 2013.